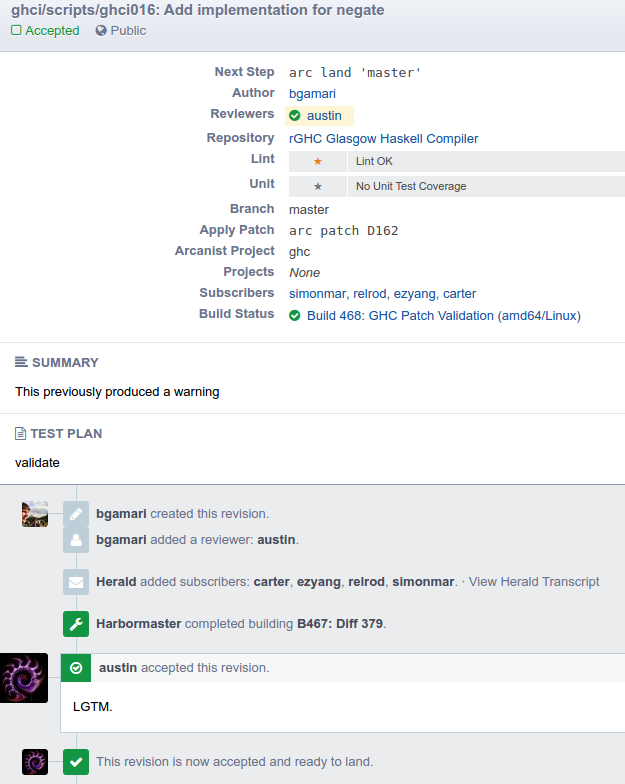 When you use Arcanist to submit a diff, Phabricator will automatically trigger a build rule using an application called "Harbormaster". This application causes a build machine in the background to apply your patch and run sh ./validate. Afterwords, your diff will be updated with a status from Harbormaster about the build, including links to build logs and testsuite results. Note that every time you run arc diff and update an existing review or create a new one, you'll trigger a build. Harbormaster also builds GHC commits that have been pushed. You can see more on the Harbormaster application. Note: You can use the word "[ci skip]" or "[skip ci]" by itself in the commit when you submit a diff or push something to skip builds. You may want to do this if you know your build will break, but you just want to post code. However, it's also useful to understand the application UI as well, so you can look through (or search for) previous builds. 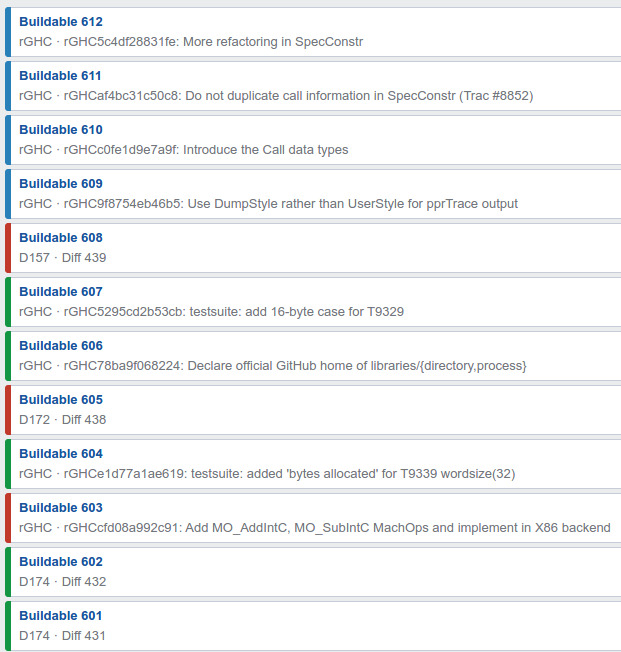 Here we see builds for commits and builds for revisions. The metadata attached to each entry tells you this: things of the form Dabc - Diff xyz represent diffs, and things of the form rGHC: foo ... are for GHC commits. Building, which means the build is currently running. This status is marked by a blue color. Failed, which means the build failed to run ./validate successfully. This status is marked by a red color. Passed, which means the build ran ./validate just fine. This status is marked by a green color. 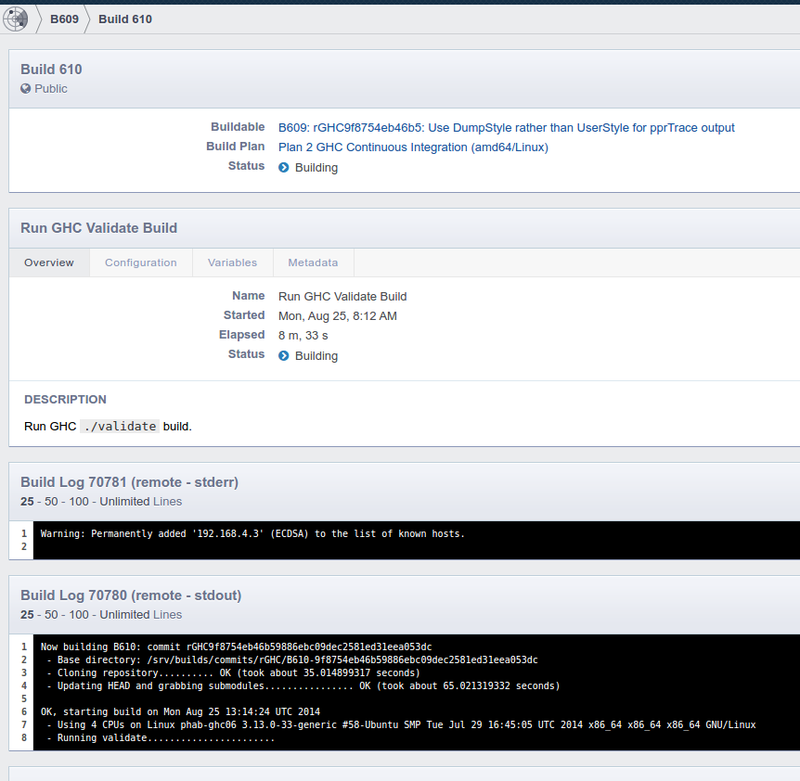 For any build, you can view the build logs. To do that, go to the harbormaster build from the application page - for example, you can go to Phab:B609 to see the results for commit 9f8754eb46b59886ebc09dec2581ed31eea053dc.